This is a pretty wacky story, so buckle up. My junior year of college I had the opportunity to go to Dallas, TX for PASIC. It was a fantastic experience - life changing, even. But it happened to fall two weeks before juries (and if you don't know what juries are, thank your lucky stars), and it meant no practice time for a week. Those of us who went on the trip - five percussion majors and our percussion professor - were talking about ways to make up for the lost practice time, and one of my colleagues mentioned this foreign sounding word to me: visualization. 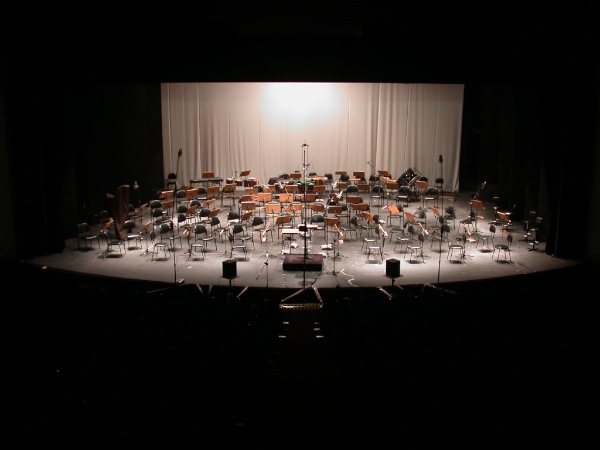 Visualization is basically this: seeing the instrument in your mind's eye, you rehearse the piece, section, or whatever it is without physically doing it. It took me some practice (no pun intended), but I was finally able to visualize a marimba keyboard and four mallets in my head. It started one note at a time, then a measure, then a phrase. The coolest thing about visualizing your practice is that there are no rules and no limits. You can sound perfect, play in an amazing venue, make no mistakes, etc. Anyway, I tried it. On the flights, both ways. On the train. In the hotel room. At breakfast. And you know what? When we got back from Dallas, I had actually improved my playing without having touched a marimba or mallets for a solid week. It was nothing short of shocking. If I had a little more discipline, I would have developed the habit of visualization and used it more frequently, but I have tried it over the years when I'm about to go on stage or start a take in the studio. Now, I'm not advocating the abandonment of actual, real-life practicing, but try some visualization, especially when you're learning something new. This is a bit backwards, but I've always believed that if you can't think it, there's no way you're going to play it. Happy drumming, and think happy thoughts! Here are my opinions on drummers. I'll bet, as a bassist, I've worked with more drummers than any drummer. I call my drummer friends when I need the low-down on a bassist. What characteristics and attributes make a drummer "good?" No matter the genre, style, or stage size, every drummer has a job. The bass player (me! ), has a job. The front man has a job. My favorite drummers have this uncanny ability to know just what their job is, do it effortlessly, and not step on the toes of the bassist, singer, etc. who's trying to do his job. It takes a lot of listening, and a lot of knowing how the guys around you are thinking. Aside from playing ability and musical skills, what makes a drummer easy to work with? Stereotypes would have you believe that drummers, if they show up at all, will be late, lazy, loud, or drunk. You'll notice that none of those have much to do with time, technique, or tone. While those things are important, remember that the guys you're playing with (or that hired you!) don't know much about your bearing edges and hand-hammering. They just know what it feels like to play with you, and more of those feelings come from off-stage than on it. What's the best compliment you could give a drummer? As a bass player, if a drummer is listening to my lines and either locking in with me (with his kick!) or syncing with something complimentary, I'm super impressed. Flattered, even. Drummers that listen seem almost "invisible". In my opinion, an invisible drummer is doing his job. What's your most frequent complaint about drummers? I'm scared by the number of drummers that don't know anything about bass playing, and vice-versa. The relationship between kick and bass is CRUCIAL to any song, any genre. There seems to be an influx of younger drummers right now that place kicks wherever they want them, and never in the same place twice. Go spend $10 on the John Mayer Trio TRY! album and have your life changed. Name the top thing that will keep a drummer from getting called for another gig. Too many notes played too loudly. Anything else you want to add, warn against or point out? No matter what you play, expand your toolbox of true-to-the-style techniques and LISTEN! 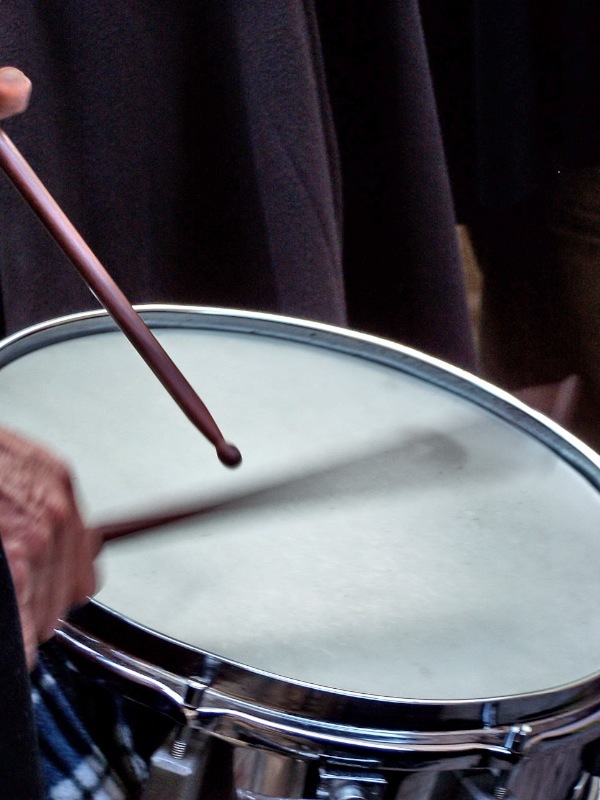 There are many factors that contribute to each drummer's sound. 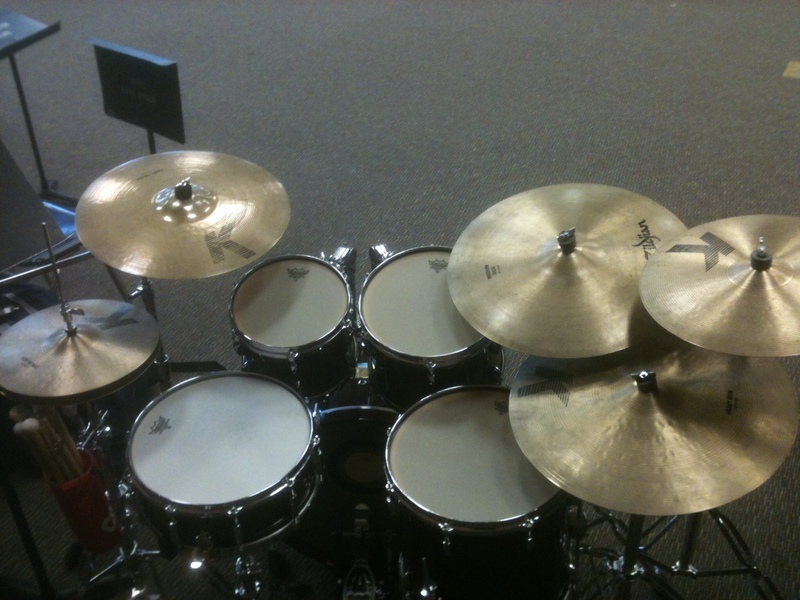 A few weeks ago we talked about cymbals, which are a huge piece. Last week we talked about the ol' kick drum. This week we'll talk about your choice of heads for the snare drum. Let's start with the batter head, or the head that you actually play - the top head. What thickness options are there? In terms of the actual construction of the head, there are basically two options - one ply or two. A ply refers to a sheet of plastic, usually mylar or kevlar, that the head is made out of. In general, a single ply head is a thin or medium thickness ply, while two plies are usually two thin. There are also some heads that are a single ply with a collar, or another ply around the edge, sort of splitting the difference between a single and double ply head. So what's the difference in sound? Single plies tend to be more resonant (they ring longer) and have more overtones. 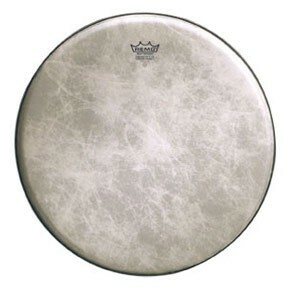 Double ply heads tend to have less resonance (they ring shorter) and have a more focused tone. Players who prefer one or the other usually swear by them for whatever reason. But many players will prefer to use heads of different thicknesses in different situations. For me, I adjust the sound more by tuning than by choosing a different head. And if it needs a little bit of dampening, I use Moon Gel by R Tom. Love the stuff. Why do heads look so different, and does it affect the sound? Usually the appearance of a head is a function of it being either coated or clear. A coated head has literally been coated with a very thin layer of either textured or smooth white coating. The most common is the textured white, which allows for brush definition and "warms up" the sound. A clear head tends to sound "brighter." Evans Drumheads has a head that has a similar feel to a coated head, but is called "etched." These heads have literally been blasted to create their texture. They don't have the extra weight and thickness of a coated head, and the texture tends to last longer. These heads are very popular in jazz settings. You can also get heads with a "control dot" - basically a sticker that adds a ply in the center of the head, about six inches in diameter - on the top or, if it's on the underside of the head, called "reverse dot." Or you can get a head that's "vented," which means it has a row of very tiny holes around the edge of the head. The vents are an attempt to remove some of the highest overtones, or "dry out" the sound. What about the snare side? Keeping in mind that the snare side head can have just as much effect on the snare drum's sound, we're only talking about your drum kit snare. We'll have to save all those scintillating conversations about concert, rudimental, field and side drums for another time. 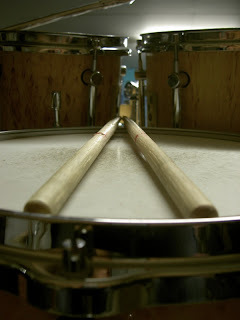 The snare side is usually the thinnest head on your kit, and also the most delicate. Since this head is the activator for your snares, the thicker the head, the tighter it has to be tuned. A lot of your snare sound, in terms of tone, snare sensitivity and "crack" will depend on the whole package - heads, shells, hoops, reinforcement rings, tuning, relative tension between the heads and the alignment of the stars. So what will you use, and why? The end goal should be your sound. What are you trying to achieve? 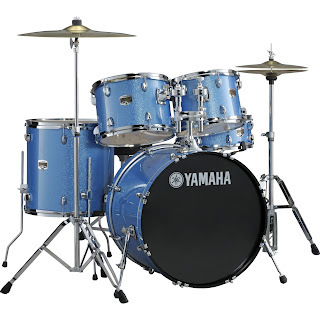 Depending on the style you play, the setting (live or recording) and the volume at which you play, the tone you want, etc, your head choices may differ very widely from other drummers. So don't worry quite so much about what's popular or what they look like. Let the music guide your choices, and play what you like. Remember that what you hear on recordings - and even through live sound systems - doesn't perfectly resemble what you hear with just your ears when you're sitting at the kit. The more you experiment, tune, record and listen, the more you'll get an ear for what you're hearing - and how it sounds to the audience, through the PA, or on playback. It's a topic for another day, but I absolutely love Coldplay. Every member of that band is a talented musician and performer. But, this is a drum blog, so we'll take a look at their drummer, Will Champion. Was there ever a more solid backbeat? I submit that there was not! One of the things that I appreciate about Will Champion is his ability to feel and fit into the music. He's there to support the message of the music, the feel, the texture, not to showboat or try to stick out. Will is the quintessential "band" drummer. He does have chops, he is creative - but he does exactly what he feels the music needs. He follows the old Tommy Igoe mantra, "I will never play a fill just because I can." In other words, he doesn't get in the way. Will Champion is as good as any drummer alive today at supporting the thing. And the thing is usually a heart-warming or soul-wrenching work of art that I can listen to time and time again. I can remember a time when I wasn't exactly a Coldplay fan. It was shortly after they started to get really popular in the States, and they only thing I'd heard was, "Yellow," from the album Parachutes. Not that I disliked the tune, mind you, I just wasn't all that blown away by the track. Shortly after, Coldplay came to my city on tour and I was given a ticket to the show by a friend. I went to the show because of said friend and had my mind absolutely blown. I've been to many a live show in my time, and I can count on one hand the number of those shows that I was actually pained when it was over. They could have played all night, and I would have listened. One thing I noticed about Will - and all of the band, really - is that he was into the music all night long. 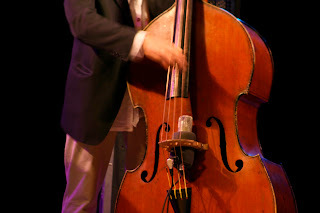 He played relatively simple, straightforward stuff, but he felt every single note. He wasn't just playing drums, he was playing music. Anyway, suffice it to say, Coldplay was - and still is - solidly on my radar. I could give you a list of my favorite tunes (most of them) and albums (all of them), but I'll let you discover for yourself. You're probably already familiar with the band, so as you listen to your next Coldplay tune, listen to the drums - just the drums. I challenge you to stay focused on the sounds and feel of the drumming, but you're going to get distracted - that's how good Will Champion is at just blending in and making music. Even if you don't like Chris Martin, Jonny Buckland and Guy Berryman, you've got to respect Will Champion. Happy watching, listening and feeling. Bag of Tricks: The Wallflowers - "One Headlight"
This is the opening lick to one of my all-time favorite pop tunes, "One Headlight" by The Wallflowers. My apologies to my private students, because you're getting another basketball metaphor. Here's the question: what makes us confident? Not only in music, but in life? While there are doubtless many things at play, I'd like to suggest one that works fantastically in drumming: The Free Throw Principle. Imagine that you're a basketball player, and you're lousy at free throws. Problem is, you never make them in games, and you never practice them. As a result, every time you get fouled in a game, you instantly get nervous. You'd almost rather just hand the ball over to the other team because you know you ain't makin' no free throw. Your confidence in your free throws at this point is zero. So let's say you finally decide to tackle the beast one day before a game. You decide you're going to shoot ten free throws. You miss the first nine, but - miraculously - the tenth one is perfect and swishes right through. Suddenly, you're a great free throw shooter, right? Uh......no*. At best, you're ten percent. That night at the game, how's your confidence? Probably a little better, but not great yet. So you keep shooting. Let's say the next day you work on your form, and you hit five out of ten, and by the next week, you're hitting nine out of ten. The first day you hit nine of ten, you're pretty happy, but soon you want to hit that many every day, and you start thinking about ten of ten. Take this to its logical conclusion, and let's say you're hitting somewhere between eight and ten of ten every day. Now you get fouled at the game, what's your confidence like? If you know you can hit 80% or better, you'll start to look forward to going to the free throw line. And if you miss one, you know that your chances of hitting the next one just went through the roof. How can we apply this to music? Simple, whatever you want to do at the game, er, gig, you need to have done in the practice studio. And you probably need to have done it many, many times at different tempi (tempos?). The point is, when you get to the gig, you shouldn't be trying to pull off crazy fills or take huge risks that you haven't practiced up to a respectable level at home. 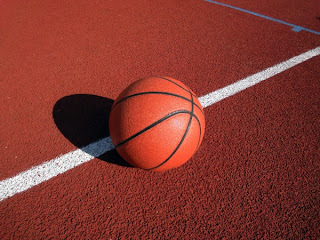 Back to the basketball analogy - even when you see somebody like Kobe Bryant or LeBron James take what looks like a circus shot in a game, remember that those boys have spent just as much time in a gym practicing every imaginable shot from every imaginable spot as you have practiced any lick, fill or groove on the ol' skins. So, again. Do it right, do it a lot. As a band teacher friend of mine has on his wall, "The amateur practices until he can get it right. The professional practices until he cannot get it wrong." *Although we do this all the time, as musicians. We work on something until we get it right once, then, "Yay! Let's move on!" What are we thinking?! I would rather have my students (or myself, for that matter) practicing just five minutes a day rather than trying to "binge practice" one day a week or right before the lesson. Think about it like trying to run faster, jump higher, or lose weight. If a really out of shape person wants to lose some pounds and get ready for a race, which method sounds smarter: 1) Workout for 25 hours by doing 50 half-hour sessions spread over about two months, or 2) Work out for 25 hours consecutively (one day and one hour)? Obviously choice 1 is smarter, because if you're really out of shape, choice 2 will land you in the hospital or the morgue! Anyway, the key is to practice a lot, but over a long period of time. So set yourself up a plan, a place, and go play! Disclaimer: A lot of what you'll read in my posts about drumheads is largely my opinion. I do not consider myself an expert, but have had a lot of time to experiment and hang with people who know how to make drums sound great. So if you think I'm wrong or missing the point, let me know in the comments! First things first: you're going to hear this a lot from me as we discuss how to get great drum sounds, but don't underestimate how much processing a natural drum or cymbal sound goes through to come out of your speakers or headphones. You might think of it as raw metal ore going through the processes to become a car. That being said, you must start with great "raw" sounds to get great results. The kick drum is the heart of your kit - and your sound. If you have a great kick sound, you're well on your way to sounding great and feeling comfortable. There's quite a lot we could talk about regarding the dimensions and material of the shell, and how many lugs and other attachments it has, but that's a discussion for another time. For now we'll focus on two basic differentiators in heads, number of plies, and finish of the head - oh, and muffling, for good measure. A ply is a single layer of plastic - usually mylar. There are different thicknesses of plies, usually a thin and medium. If you want a really thick head, you're usually going to get two plies. In addition, you can get a single ply head with an extra ring around the edge, so you end up with two plies around the edges to dampen some overtones, but a single ply in the middle. In addition, there are numerous additions to heads like pinstripes, but we'll talk about that in a second. So what's the difference in sound? For kick drum, you probably have different sound goals depending on what you play. A two-ply head will give you a shorter sustain, darker tone and more "punch." A single-ply gives you longer sustain, brighter sound and more tone. Here are a couple of generalizations: Single ply is for jazz and recording. Double ply is for rock and live sound. Good luck with that. Essentially, the more you add to a head, the less overtones you get, the less resonance you get, etc. So what gets added to a head (besides plies)? First is a coating. Coated heads provide a warmer tone, less crisp attack, and the texture makes brush playing possible on snare and tom heads. I guess you can play brushes on the kick, too! Aside from coating, all manner of strips, stripes, dots and etchings have been tried to create a certain tone, response or playability. Luckily, you' don't have to try absolutely every head to figure it out. Most of the head manufacturers have a chart that will guide you to the kind of head you should try based on the sound you're looking for. I also recommend some sort of patch for the kick head right where the beater contacts it. No matter how softly you play, you'll want to reinforce that spot so that the head lasts longer. The effect on tone can be an issue, but you can usually get what you want with tuning and choosing the right beater. Alright, this is getting long. More on heads next week! Let's continue the discussion in the comments below. Over the next several weeks I'll be talking about how drumheads affect your sound, and giving some basic advice on how to choose heads. We'll talk about what the differences in heads mean to your sound and the playability of your kit. There are more choices all the time, from time-tested classics to heads for very specific applications. If you know what you're looking for - and at - you'll have a better chance at sounding like you want to. Before we start, though, two quick stories to set the stage. I once had the opportunity to take a lesson from drumming great Adam Nussbaum. It was extremely worthwhile. Among other things, he talked a lot about being able to "trust" each sound in your kit so that you don't overplay. His thought was that the less you had full, resonant sounds, the more notes you felt like you had to play. I agree. Each sound in your kit should be something you absolutely love and can use with confidence. There should be no sounds that you avoid using. When I first decided to get serious about drumming, I knew my sounds were bad but I knew almost nothing about tuning, and even less about drumheads. I had a 22" Tama Rockstar kick, and I had picked up two Remo Renaissance heads on clearance. I was thrilled to have new heads, but absolutely hated my new sound. It seemed really pingy to me, and didn't have the low fundamental and punch I was looking for. So I went into one of the big-box music stores (it's a chain that no longer exists, but will still remain nameless) and asked the "drum guy" about heads and what I could do to help my sound. His answer was classic, "Y'know, man, a bass drum head is a bass drum head. They're pretty much all the same, so the sound you're looking for is what the sound engineer is for." Needless to say, it was the beginning of my journey to better sounds - and much more satisfying playing. So, let's get started. On Monday, we'll talk about bass drum heads and get the heart of your kit sounding great. Update 2-19-2012: The store was the now-defunct Mars Music. I was trying to hint at that and actually named an existing music company. My bad. The actual Jupiter Music has a great reputation, and I wasn't attempting to make any derogatory comments about them, at all. 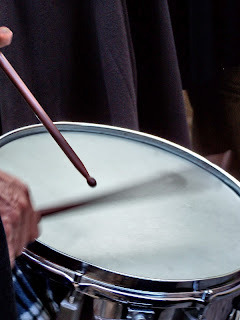 This blog is all about percussionists and drumming and things you can hit. Well, what about people who create hits? I know you're already familiar with Sara Bareilles (because if you're not, you've literally been under a rock for the past five years), but I thought I'd just share a couple of tracks you may not have heard. First is an unbelievably convincing cover of a tune that you also know (and if not, see the preceding comment about 'under-rock dwelling'). Seriously, Sara B covering Beyonce's "Single Ladies?" What could be better? Even though I'd heard the original tune about a billion times, I never really liked it (sorry, B) until I heard Sara's version. But now every time I hear any version of the tune, I remember this video and smile. It's awesome. Another cover, this one a classic tune that would have been easy to desecrate, that Sara handled with heartfelt class and grace. I heard it on Pandora one day, and it literally stopped me in my tracks. It's worth listening to that again, don't you think? C'mon. Press play one more time. And, lest you think I only like Sara covering other people's stuff, here's one that almost made me drive my car off the road when I first heard it. Clever, witty and cutting - a modern era classic. For me, what makes Sara a great artist is her ability to create her own art with her own, distinct style, whether it be a song of her own, or a fresh take on somebody else's. As always, I'm not trying to tell you Sara Bareilles' story, just give you a brief introduction and jumping off point. Bag of Tricks: Anna Nalick - "Satellite"
At the 2:58 mark, this fill caught my attention. Beyond the Kit: Why music matters. Last week I posed the question, "Why music?" Why does it exist? What's its purpose? Why does it matter? Music is one of the defining aspects of humanity. It separates us from the other living things on the planet (I know there are some arguments that other animals make music, but we can discuss that another time). Our society is reflected in our music, and music surrounds us. Imagine walking into a store with no music playing. TV and movies with no music. Video games with no music. No concerts. No music videos. No iPod. For that matter, probably no YouTube. Music is part of who we are as human beings. Music makes me feel. Quite simply, nothing else touches my emotions in the same way. Music makes me think. It takes me to places in my mind and heart that I don't get to without it. Music allows me to communicate far better than I can in any other way. Music makes me better. I'm a more sensitive, thoughtful, passionate and effective human being. Like sports, music is fun. I tell people all the time that some guys bowl or play poker, but I get to play jazz and rock and roll gigs. Awesome! Alright, if you've read this blog with any regularity you already know that I suggest that you can apply any exercises for your hands to your feet, as well. Today, let's apply a simple exercise that uses hands and feet at the same time. Of course, you can apply any sticking pattern to this rhythm and play it any tempo. For this example, we'll use paradiddles (R L R R - L R L L). And instead of using two hands, we'll use the left hand (LH) on snare drum and right foot (RF) on kick drum. Again, start slow and make sure you're playing relaxed and controlled. 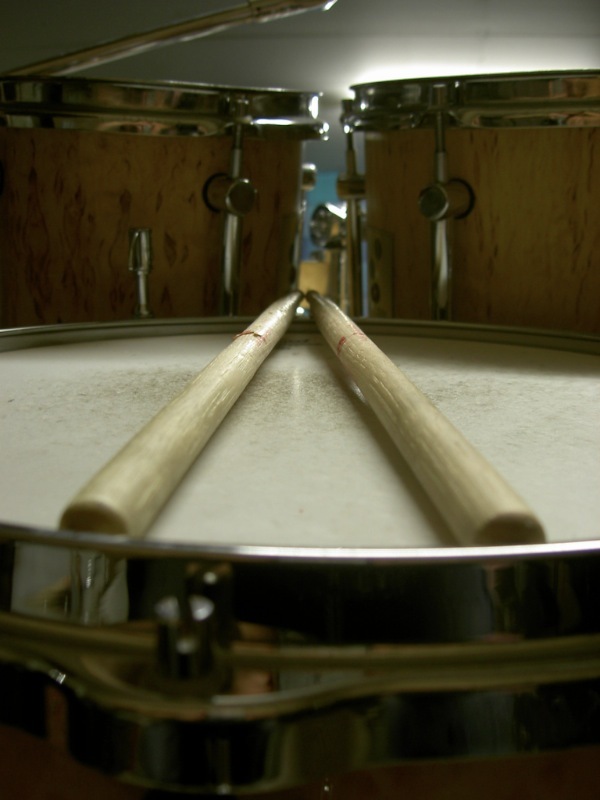 Make sure each stroke sounds even and that the kick and snare are balanced. If you're feeling adventurous, alternate every snare drum stroke (and kick drum stroke, too, if you're playing double bass). Of course, this is just one application of this concept. Using the Slow-Fast template - or anything else that works for you - try splitting up your favorite patterns between hands and feet. Then apply it to the music that you love. 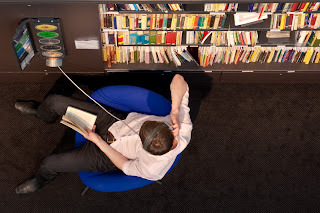 So what is all the fuss about electronics? I'll let you make your own decisions, but here are I few of the benefits and drawbacks I see with the way of the future. They've gotten good, but they still don't feel or respond like real drums - and especially cymbals. Cables and inputs and plugs, oh my! Seriously, I've always been grateful that when I show up for the gig, I don't have to plug anything in. The electronic drum kit changes all that - and it ain't good. I can't wait for the whole thing to be wireless, power included. Again, they're not as bad as they used to be, but electronic drums just look fake. I'm not all about vanity, but you still lose a certain degree of legitimacy if you show up to a high level gig with "fake" drums. They've gotten good, really good. Seriously, have you played one of these things lately? Mesh heads, drum-like shells and realistically raised rims have changed the world. They're getting closer to real drum feel all the time. Not only that, but the different strokes (rim shots, clicks, pings, etc.) have become a real possibility. The cymbals are, erm.....better. At least they're round, they're seated on a cymbal stand so they can move a little, and sticks bounce off of them. You also get bell, flat and edge sounds. The selection of sound samples has exploded, and the quality has improved immensely. You can choose the size, material, configuration, heads, tuning, atmospheric pressure (okay, made that up) and more. You have thousands of sound options at your fingertips, and they all sound great. Volume control. Honestly, this should be the top of the list. Not only can you protect your hearing, you can play as hard as you like and not wake the baby - let alone the neighbors. Throw on the headphones, and you're a drumming hero that nobody can hear but you. Triggers, loops and other instrument samples have changed the role of the drummer. Simply put, you can be more than just the drummer. Like I said, you have to make your own choices. And when it comes to which brand or configuration to choose, well, that's a subject for another post. For now, check out the ol' Rabb-meister. It's a gig of sorts, for my work. Last week I had the good fortune to travel to Cedar City with Ryan Tilby and Aaron Ashton to work with orchestra students at Cedar High and Middle Schools, and Canyon View High and Middle Schools. It was awesome. Great teachers and students, and a lot of fun besides. 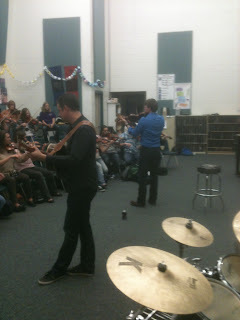 Our job was to talk to string players (violin, viola, cello and bass) about folk and Celtic music, and teach them some basic improvisation. 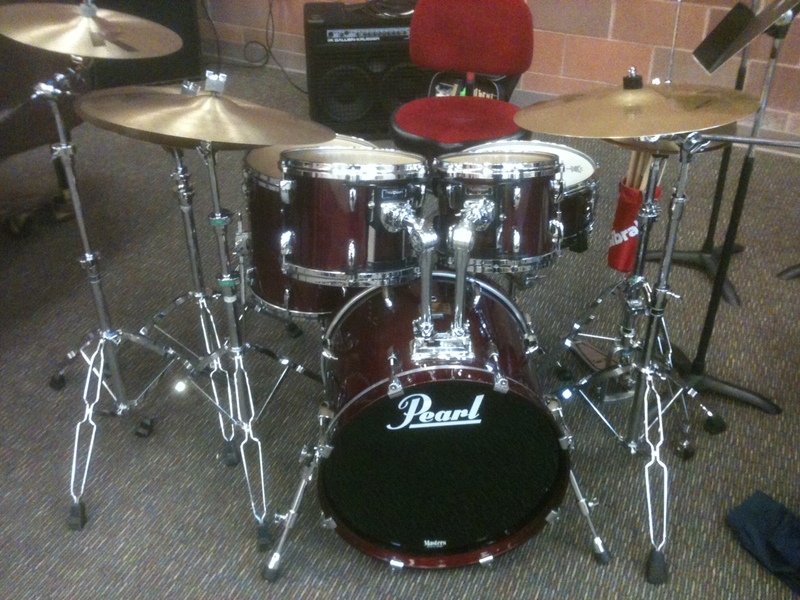 Aside from that, I had the opportunity to work on some drum kits. 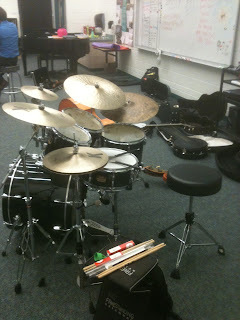 I've included just a few pics of one of the clinics and a couple of drum kits. I know I put this on the Facebook page already, but I just got hipped to these guys this week, and I can't get over the simple innovation of this performance. The tune is called, "Somebody I Used to Know." You can check out Walk Off The Earth here. It must be a really busy time, because I'm reposting another blog post from last year. It's a good one, though. Definitely something to have in your bag of tricks. The groove below is one that I learned a long time ago from an awesome drum teacher named Jay Lawrence. It's called, 'bikutsi.' Enjoy! I'd appreciate any comments, below. Beyond the Kit: Why music? 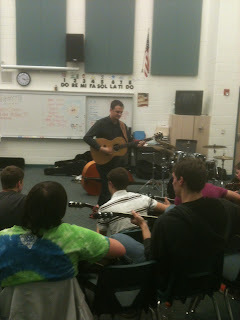 So, I taught high school music classes for five years - band and guitar. It was a blast, for the most part. Loved it. One of the assignments I gave each year was to have the students write a paper (a short one, but a well-crafted and thoughtful one) that answers the question, "Why music?" Today I'd like to pose the question to you, as well. So - why music? Why does music exist? What's its purpose? What does it do? Is it important? Why? I'll give you my personal philosophy - if you care to read it - next week. We all know the "Eight On A Hand" exercise. It's a staple of drumming life. So, let's take it to the next level, shall we? Much of the music we play on the drum kit (and really all percussion, for that matter) requires a fair amount of endurance. To meet that need, use a simple, "Sixteen On A Hand" exercise. Just take "Eight On A Hand," and extend the form to two measures (sixteen consecutive notes) on each hand, and change the time signature to cut time or 2/2. Even simpler, just think of the exercise as one measure of sixteenth notes for each hand. 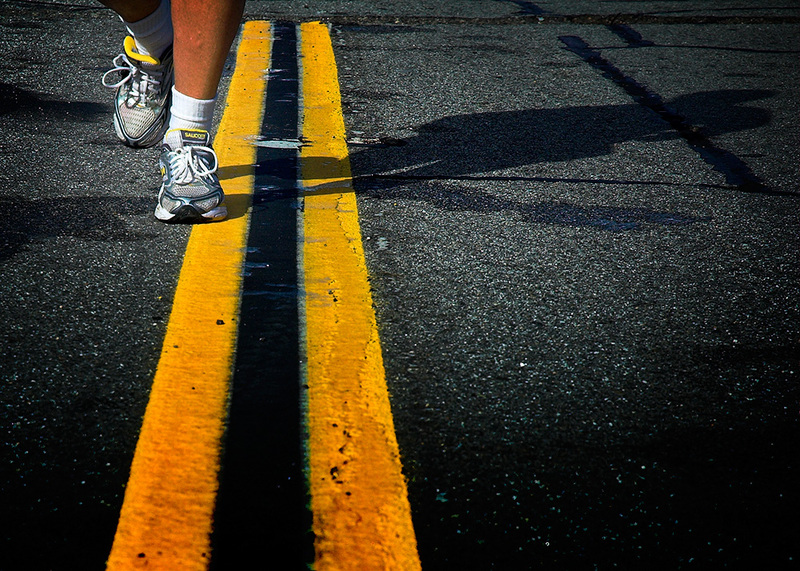 As always, remember to start slow, stay relaxed, and gradually increase the tempo. It should take weeks, if not months, to work up to obscene tempos (tempi? ), so just work it up one or two clicks per day. As an added bonus, this will increase your single stroke speed (I know - duh! Didn't I just say that?). Think about this: alternating sixteenths are really just Eight On A Hand. If you start the left hand one sixteenth note after the right hand, then both hands are playing eighth notes, but the result is single stroke sixteenths. When you start with Sixteen On A Hand, the same idea (left starts one 32nd note after the right) applies, and you get alternating 32nds. Sweet, no?! Hopefully that all makes sense. Try it. You'll like it. And you'll be faster in no time. Just got back from the UMEA Mid-Winter Conference. It was awesome! Among the many people I met and things I learned, I may have come across a solution for a dilemma I've been having. 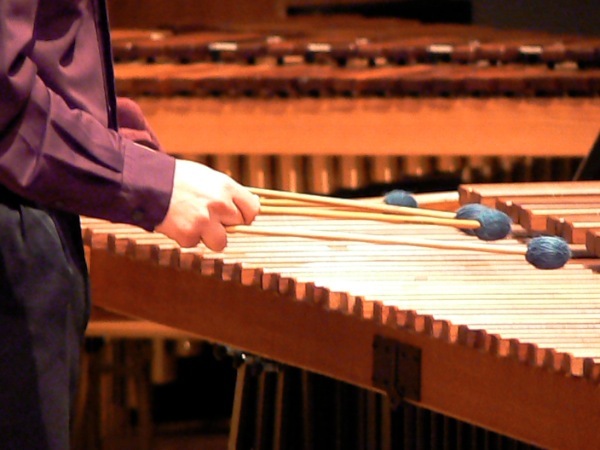 How do I get a marimba for less than an arm and a leg? Once I get one, how do I keep it from taking up my whole house? I'll be brief and let these products speak for themselves, but here are two I was able to get an eye on, and at least one of them is definitely going to be getting a new home at my house! I couldn't be happier to start seeing some lower-priced instruments for percussionists. If you're taking lessons from me, you can expect to see some of these instruments in my studio soon. ANNOUNCEMENT: Aaron Ashton, Ryan Tilby and Keith Sorensen (and possibly another special guest or two) will be performing an exclusive house concert in Cedar City this Saturday night, February 4, 2012. Details on the Facebook page. Pretty darn excited to introduce you to one of the premier musicians in the intermountain area. Violinist Aaron Ashton has traveled many musical paths, and isn't afraid to blaze new ones. His repertoire ranges from classical to celtic, from folk to funk, and from jazz to just about everything else. Luckily for me, the other guy moved out of the area, and a couple of years later I ended up playing for Aaron's band, In One Ear. 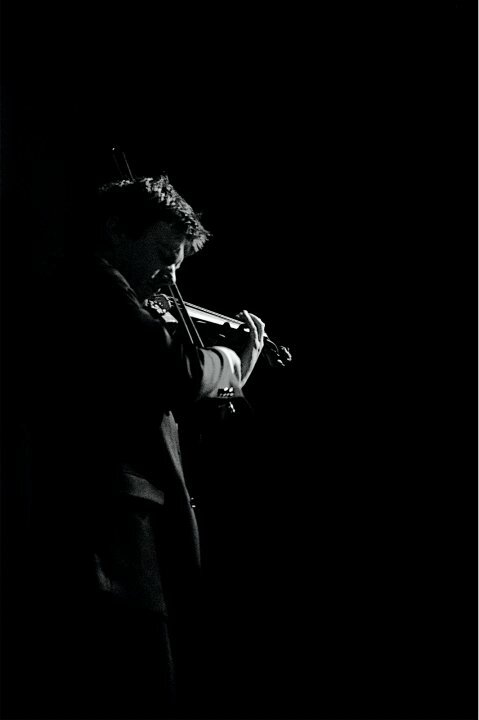 Not only did I get to know Aaron and his playing, I was introduced to many other great players and a mind set of playing, performing and composing both in and out of the box. Since then, Aaron and I have worked together on a ton of projects, recordings, bands, shows, etc, including The Aaron Ashton Band, Hillside Nine, Lokalgrown and many more. But all of that doesn't begin to scratch the surface of Aaron's career and accomplishments. He has played on countless film and TV soundtracks and video games, made cameo appearances on roughly a gazillion albums, and produced and engineered a gazillion more. He was also a member of Enoch Train and founded Blue Sky Music Camps, a premier summer workshop for aspiring musicians. Oh, and one more thing - Aaron is both an Aggie (Bachelor's degree from Utah State University) and a Cougar (Master's degree from Brigham Young University). True story. By the way, I'm sorry if this sounds like a eulogy. Dude's not dead. In fact, he's well this side of forty, and still growing and evolving as a musician and as a person. I just respect the guy as a colleague and friend, and can't say enough good about him. Just visit his webpage, buy his album and catch a concert. I'd say "or," but you should really do all three. 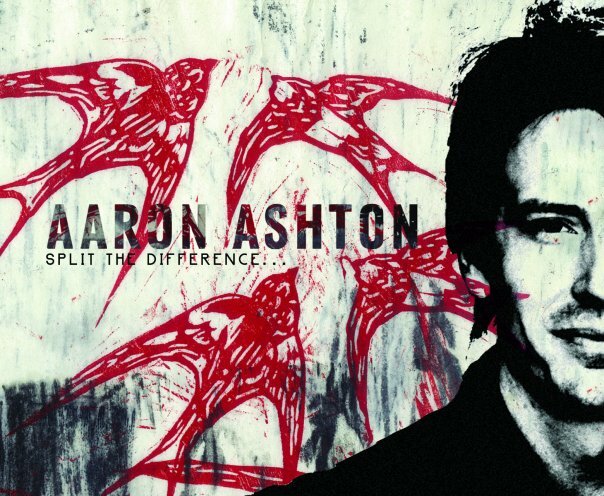 This was one of my favorite shows I've played with the Aaron Ashton Band. Great players all around. I know it seems pretty pretentious to give you Carter Beauford one week and me the next, but this is a lick I just keep using, and I need to pass it along for my own mental health. It works great in the 100-120 BPM range. Let me know what you think. On the road this week, so I'm recycling a post that I thought was appropriate going into festival season. Occasionally I have the opportunity to serve as a judge or adjudicator at festivals and competitions. It's a great learning experience for me, as well, as I'm often looking for indicators of a musician's preparation beyond the music. Many times a musician is playing very well, but not performing well at all. 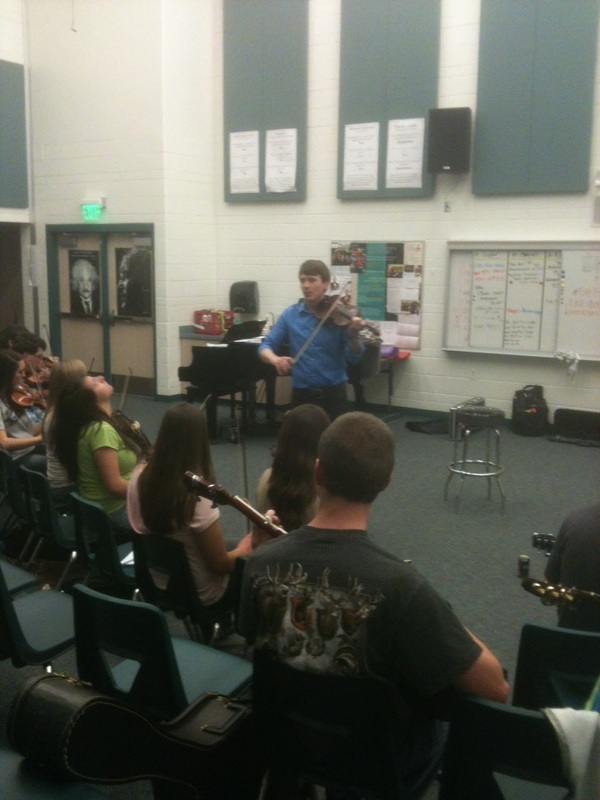 The music may be really great, but performing means going beyond the music and presenting yourself well in all areas. 1. Appropriate dress. You wouldn't show up to a rock concert in a tux, so why would you show up to a recital in a t-shirt? If there are any questions as to what is appropriate dress, ask the teacher or conductor - or your bandmates - or go online for some pictures or guidelines for the type of event you're playing at. 2. Speak clearly. 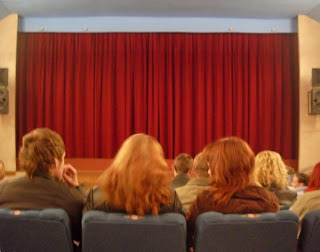 Many a good performance has been ruined by sloppy language before the music starts. Again, ask your teacher for help or find some information online. A good place is to simply tell the audience clearly who you are and what you will be performing. If you don't know what to say, just smile and play your piece. Let your music speak for you. 3. Stay in 'character.' Keep your composure! Keep a pleasant expression on your face, don't react to mistakes, and - unless it's part of your performance - don't let the audience affect you. Things are bound to happen - someone will sneeze, a baby will cry, you'll drop a stick, or whatever. Don't get frustrated, just keep playing. If you have to stop (to pick up the stick! ), just start back where you stopped and move forward as if nothing happened. If you don't make a big deal of it, chances are, neither will your audience. 4. Don't apologize. Before, during and after the performance, keep your game face on. Don't say things like, "I really didn't practice that much," or, "I'm not ready yet, so this isn't going to be that good," or anything before you play. Even if you know it's going to be terrible, refer to number 2 above. During the performance, no matter how many mistakes you make, keep playing. Do not say, "Sorry," or, "Let me start over." Just keep going. Don't acknowledge your mistakes. If the absolute worst happens and you just can't finish, simply smile at your audience, bow or say, "Thank you," then walk off the stage. When the applause happens, acknowledge it with a nod, or bow and smile. 5. Accept compliments. Even when you feel like you've had the worst performance of your life, someone is bound to tell you how great you did. You'll want to say something like, "What?! Didn't you hear that? I was horrible!" But don't! Just say, "Thank you," and leave it at that. 6. Be prepared. Maybe the best way to build confidence is to be very well prepared. If you've practiced and polished your music until it shines, and you know you can play it very well, you'll have no trouble feeling good about the performance, and you'll have no reason to be awkward or ungracious. 7. Stay engaged. If you're not playing solo, make sure to support the other performer(s). 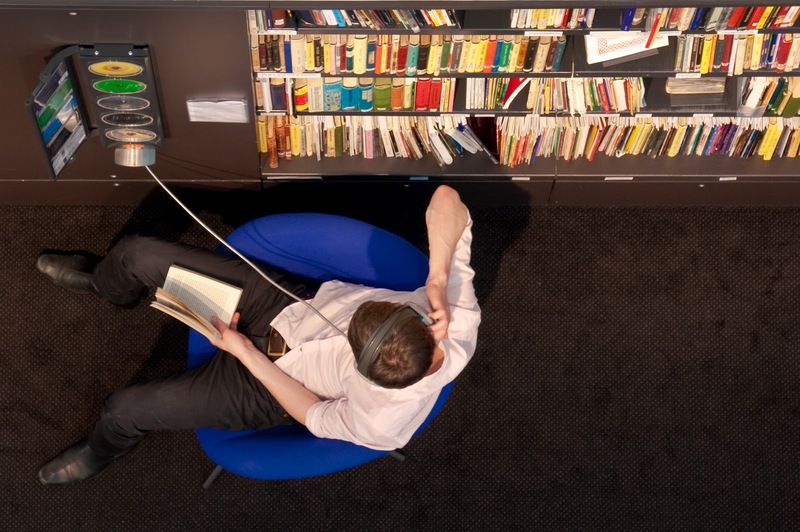 Never give any impression that you're bored, tired or distracted in any way - even if you have to rest for 168 measures. If there is a solo going on, watch the soloist. If someone is singing, look in their direction. Try to let the audience and your fellow performers know that you are supporting them in any way that you can, even if you're not playing. 8. Don't distract. Even if it's a rock concert, there's a time to play and a time to keep quiet. Especially in between songs, don't practice or "noodle" on your instrument. Start together as a group, and end together as a group. Let all of the sounds you make be part of the music, and on purpose. You may think that everybody knows that you're making sure your snare drum is working, but all the audience hears is unnecessary noise. Next time you go to a live concert, pay attention to what the performers do aside from playing music. You'll start to notice pretty quickly that some things make the performance better, and other things make it much worse. With a little effort, you can not only play great music, but have a great performance, as well.